Excerpt from “Emotional Safety: Personal and Character Development,” from chapter 15 of Creating Emotionally Safe Schools by Dr. Jane Bluestein © 2001, Health Communications, Inc., Deerfield Beach, FL. This excerpt was extracted from the manuscript for this book and may be slightly different from the actual printed copy. The entire bibliography of Creating Emotionally Safe Schools is available on this site for more details about the references listed above. Teachers historically have been evaluated and rewarded for their academic performance. As a result, many teachers underestimate their own helping skills. Tears are the language of the limbic brain. They ought not to be restricted. I felt emotionally safe when I did not express many emotions. Listening is not the same as waiting to speak. The difference boiled down to one common element— the presence or absence of a “sympathetic witness.” The abused children who grew up to be successful, functional adults had, at some point in their history, an adult who listened to them and believed their stories, someone who was available to bear witness to the abuse they had endured at the hands of some adult in their lives. I use this rather extreme example cautiously, as I believe that all children need to know they’ve got someone in their corner— not just those suffering from trauma or abuse. Sometimes a picture of “Mrs. Murphy” or a big stuffed animal is enough. But there are times when more personal and interactive support is called for. Unfortunately, many teachers who are willing to provide this support are so overscheduled and have so many students, they end up doing their listening and connecting on their own time or referring students in need when help is, indeed, available. More often than not, however, we are rushed, distracted, and stressed when we are needed most. As a result, our responses— while occasionally expedient— aren’t terribly supportive. The most effective responses comes when we can be patient, objective, and empathetic, which can be tough when we’re getting ready to give a test or start a lesson. Acknowledging an upset student (“This is important. I want to hear what you have to say.”) and setting aside a more convenient time to listen (“I’ll be free when the bell rings,” or “Let’s talk after I get this group started.”) is a reasonable alternative, one that will generally appease even a fairly distraught student. In general, schools are not well suited— philosophically or architecturally— to private emotional expression and processing, or even solid one-on-one exchanges. In general, the message in most school settings is this: You are emotionally safe as long as you suppress your emotions. In our haste to get through the academic material, and our abiding focus on all things cognitive, we end up with an emotional environment in which children’s feelings are inconveniences for us and liabilities for them. This is also the case in classrooms in which adults insist on perpetual cheerfulness, and those in which adults and children have not learned to respect certain feelings and sensitivities. 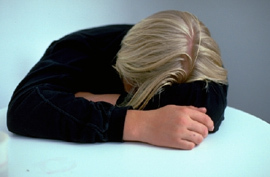 Safety can also be compromised when peers ridicule or attack a child’s emotional expression, especially when the adult does not advocate or support the distressed child. Further, Frederic Flach has observed that people who pride themselves on “never falling apart” have more difficulty learning from their experience, lack insight, creat problems for those around them and are more vulnerable to the impact of change. All emotions carry some kind of information or “message,” says DeBeaufort. Rather than suppressing or ignoring feelings, she recommends staying with the feelings until we grasp what they are trying to tell us. But this option is rarely encouraged culturally, and perhaps even less so in a learning environment. The majority of emotional “crises” most teachers encounter generally require little more than validation and, sometimes, a little time and space to regain some balance. I’ve seen extremely agitated children settle down quickly without having to repress or stuff their feelings (but instead, letting go of their emotional upset and shifting into more rational, cognitive functioning) when their complaints were met with understanding and acknowledgement. I remember one of the first times I was able to pull this off. It was shortly after learning about techniques like validation and active listening at a conference, when one of my students came in from the playground nearly hysterical because someone had called her a camel. This happened a few minutes before my class was returning and I was, conveniently, free to listen. After a minute or so, she took a deep breath and looked at me. I had to fight the impulses of some old, bad habits, and instead of responding with my usual, “What did you do to her?” or “Just ignore her,” I agreed that it hurt when people called us names. “Yeah,” she said, exhaling, relieved. And that was it. I’ve always had the feeling that she didn’t want answers, and she didn’t want advice. (And I’m reasonably certain that she didn’t want to be yelled at, either.) She just wanted permission to be upset. Once granted, she was, in a word, done. Listening provides a forum for learning to solve problems and express feelings responsibly. Good listening skills can also reduce a child’s stress, build connections and lay the groundwork for greater cooperation. When we can make time to listen to what kids have to say— truly one of the greatest gifts we can give a child— there are a few things to keep in mind. Let’s also watch the tendency to interrupt, show impatience or rush the speaker, ask trivial questions, make assumptions, or jump to conclusions. And let’s resist the urge to minimize or fix the problem, deny their concerns, cheer them up, or use their problems as an excuse to promote our own agendas, say what we think they should have done, top their story, or project what we would have done or how we would have felt. A tall order, indeed— one for which few adults have had strong models or much preparation. Lawrence Shapiro observes that we often fail to credit kids with the capacity for solving their own problems. “Too frequently, we jump in to help before help is really needed, or we assume. . . children should have decisions made for them,” he says. He notes that kids are capable of solving even very complex problems when given the opportunity and encouragement to do so. Working with the assumption that the students have the answers and the ability to figure out solutions allows us to interact in the role of a guide. The questions we ask help them to explore their options, anticipate possible outcomes and take responsibility for working things out. “I don’t think that emotional safety has anything to do with being in an environment where you feel free to fall apart or spill your guts at the drop of a hat,” claims school administrator Pat Freeman. Instead, she recommends creating an environment in which “a child understands that it is normal to have good days and bad days, successes and failures,” one that emphasizes learning coping skills. Elaine DeBeaufort agrees: “The old choices were express and make outer trouble or repress and make inner trouble. . . There is, however, a way out of this trap.” Our brains are wired, she notes, to allow us to recall emotions which are registered in the long-term memory of the limbic brain, and deal with them in appropriate ways at appropriate times. It’s also worth remembering that respecting peoples’ feelings and creating a space for them to have feelings is quite different from pressuring them to express their feelings. Additionally, feeling an emotion and describing (or analyzing) it are different processes, using different parts of the brain. 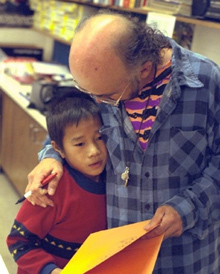 While there is value in each process, as DeBeaufort notes, “I believe our emphasis on expressing feelings has inhibited our freedom to feel.”  Very often, simply allowing the feelings to be there, without “adding the burden of conscious expression,” or asking the child to defend or explain the feelings, is all we need to do. For those times when feelings are too “big” to contain, or when they’re likely to interfere with the learning or teaching process, it is possible to accommodate students in ways that don’t disrupt instruction. Simply sticking them behind a desk and demanding their attention is not likely to accomplish much. An upset student— one in survival or the throes of an emotional hijacking— doesn’t have access to the parts of the brain she’ll need to cognitively process, store, or retrieve whatever it is we’re trying to teach. A few minutes alone (perhaps out in the hall with a couple of tissues), a trip to the water fountain for a drink of water, or a cool-down lap around the gym can work wonders, and get a child to a place, physically and emotionally, where she can deal with the feelings from a less reactive or survival-oriented part of her brain. A high school teacher in one of my workshops made a practice of giving each of his students a paper pass at the beginning of each semester that said, “I’m having a bad day. Leave me alone.” He created the system to allow some flexibility for kids were too upset to really get much out of the class academically but had nowhere else to go. He said that kids rarely used the pass unless something fairly extreme (and, typically, pretty recent) had happened. “It’s more of a safety net,” he said, one that allowed an upset student to stay in class, safe, to have his feelings. Writing is another outlet for some students. 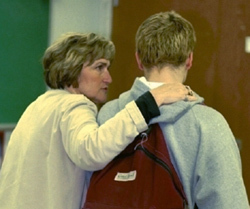 Exasperated by a constant stream of complainers and tattle-tales, as well as her own difficulty in curbing her habitual non-supportive responses when interrupted, one third-grade teacher developed a “tattling form,” which her students could fill out when they were having a problem. The five parts of the form— your name, the name of the person bothering you, something nice about that person, describe the problem, and tell how you can solve the problem— allowed upset students to get their feelings out on paper and focus on a solution, while buying the teacher a little time so she could approach the kids less reactively and at a more convenient time. Other teachers allow time for kids to go off to a more private corner of the room (or school) with a journal. “Journals are great listeners when you’re sad, angry, or grieving” writes teen author Jessica Wilber. “You can tell your problems and secrets to your journal.”  Other teachers provide outlets in the form of activities such as group discussions and sharing circles, places in which kids can openly express feelings and look for solutions to problems. Linda Lantieri noted that “most children want and need to talk about what happened.” She also assured parents and educators worried that talking about disturbing issues and events would be frightening to children, telling them that our silence could make the situation even more scary. Students of all ages with whom I spoke after the tragedy agreed, confirming how reassuring it was to have had teachers who spoke with them about what had happened, and ask about how they were coping. These skills are valuable, not only for debriefing kids after a critical incident and making appropriate referrals, but also dealing with affective issues on a more immediate and day-to-day basis. Teachers are often the first line of defense in crisis prevention, even in schools in which counselors, psychologists, or social workers are available. William Fibkins, “Training Middle School Teachers to be Effective Helpers,” Schools in the Middle, Vol. 8, No. 6 (April, 1999): 7. Quoted in Jessica Wilber, Totally Private and Personal: Journaling Ideas for Girls and Young Women (Minneapolis: Free Spirit Publishing, 1996), 128. Quoted in Siccone and L ópez, 195. Burns, 92-93, citing Miller ’s work in her book, The Untouched Key: Tracing Childhood Trauma in Creativity and Destructiveness (New York: Doubleday, 1990). Bluestein, Parents, Teens and Boundaries, 141-149; Bluestein,21st Century Discipline, 128-129. Whitfield, 100; Dwyer, Osher and Warger, 4; DeBeaufort and Diaz, 125; Hannaford, Smart Moves, 58-59, 171. Schultz and Heuchert, 87-88; Bluestein, 21st Century Discipline, 136-138; “How You Can Support Columbine High School,” (May 1, 1999). Available: University of Colorado at Boulder Web site, [Internet, WWW], Address: http://www.colorado.edu/Chancellor/columbine/; Larry Barker and Kittie Watson, “Power Listening Lessons,” Bottom Line Personal. Vol. 21, No. 24 (Dec. 15, 2000): 1; “Listen to Your Children,” NAESP Report to Parents. Alexandria, VA: National Association of Elementary School Principals, Sept. 1999; Harriett Brittenham, “How Are You Communicating?” Resources, Newsletter of the Brittenham Consulting Group (August, 1999). Note: If the confidentiality is conditional, let the student know ahead of time. For example, as a volunteer, I felt obligated to report any information which suggests that the kids I was working with intended to harm themselves or others and they knew this going in. Anything else went in the vault. Reprinted in Fox and Forbing, 106. Wilber, 129. Note: I wholeheartedly agree. I’ve been keeping a journal for close to four decades and can attest to its value in my life— not just in helping me understand and release what I’m feeling, and increase my awareness and accountability, but to brainstorm solutions and, occasionally, keep from saying or doing things I’d be sorry for later. Goleman, Emotional Intelligence, 266-267; Akin et al, Character Education, 9-18. Fibkins, 6-9; Kendall Johnson, 1; Marina London, “Providing Critical Incident Services to Children and Adolescents,” EAP Digest, Vol. 19, Issue 5 (July/August 1999): 19; David Hagstrom, “Seeking Clarity About Crisis,” Educational Leadership, Vol. 56, No. 4 (Dec. 1998/Jan. 1999): 53-57; Debbie Waddell and Alex Thomas. “Disaster: Helping Children Cope,”Communiqué,Newsletter of the National Association of School Psychologists, Special Edition (Spring, 1999): 12-15.